Sometimes removing bird baths, houses or bird seed can be enough to discourage birds from visiting. Avid bird watchers enjoy viewing birds in their yard and around their home. You may even provide wild birds with bird baths, houses or feeders. As relaxing as bird watching can be, if the birds in question set up a nest in your yard and incessantly chirp, they may overstay their welcome. If you want to get rid of chirping birds, you can do so yourself for little money and just a little effort. Use a guide book to determine the type of bird you are dealing with. Knowing the type of bird that you want to get rid of will help you know your options. Since most birds are protected by different laws and regulations, determining the type of bird in question will help you determine what you can and cannot do. Speak with a local wildlife official to find out the rules and regulations regarding different types of birds. You want to ensure that the type of bird you are dealing with is not protected and you are not breaking any laws by dealing with the bird. For example, starlings are not protected, so you will be able to be more aggressive at discouraging them. Apply a barrier to your home. If the bird is setting up nests in your eaves or rafters, you can place barriers to discourage them from roosting there. A simple barrier is a stretch of coiled wire. Stretch the coiled water out over the eaves or rafters and staple it into place. Bird will not want to rest upon the slinky. Use noise deterrents to startle birds from perching in around your home. Cut three to four 1 inch strips of aluminum foil for each deterrent you want to make. The strips should be as long as the height you have in the space you want to hang it. Pass a needle and thread through the ends of the strips of foil and connect them together. Space the strips so they can reach each other when they move but are not touching while resting. Hang your strings of foil in your eaves. When birds touch the foil, it will make noise, which they will dislike. Take away bird’s nests if this is approved by a wildlife official. 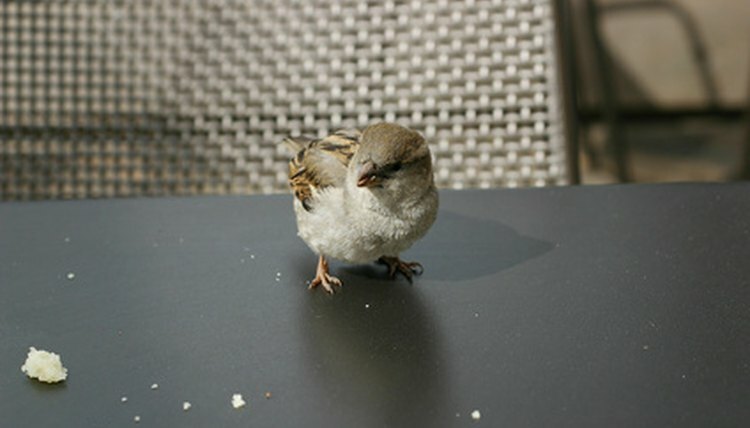 Certain birds, such as English or house sparrows, pigeons and starlings, are not protected and nest can be removed without approval. If you have nests in your fireplace, contact a chimney sweep to remove them. Attach wooden bird of prey silhouettes to your roof or position them around your yard to discourage smaller birds from visiting. These silhouettes can be found at most hardware stores and agricultural centers.